14 Aug 2018 --- The baobab superfruit has been enjoying an NPD resurgence, boosted by renewed interest in the digestive health and low GI space, as well its strong potential for use in the sports nutrition market. The superfood – which is touted as offering low GI appeal, a high dietary fiber content and for being rich in vitamin C – has seen annual growth of 53 percent, according to Innova Market Insights data. 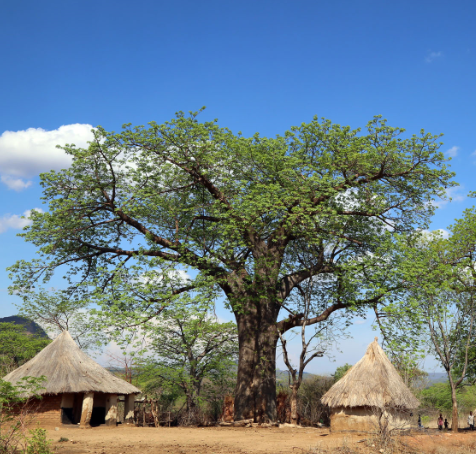 Speaking to NutritionInsight, Henry Johnson, baobab specialist at EcoProducts, details the growing array of applications for the superfood, as well as the economic ripening of the environment for market growth for baobab. 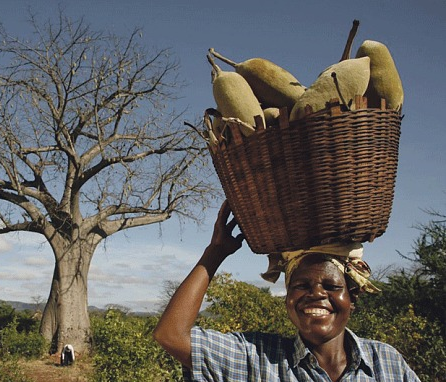 There was a time when baobab seemed to be trending among the superfoods, with “the press hailing it as the next acai berry,” however, this flurry of activity around the baobab occurred right before the 2008 financial crisis, “when companies essentially battened down the hatches,” says Johnson. With its swollen, bottle-shaped trunk and root-like branches, which spurred the local name “the upside-down tree,” the baobab tree is an icon of the African savannah. 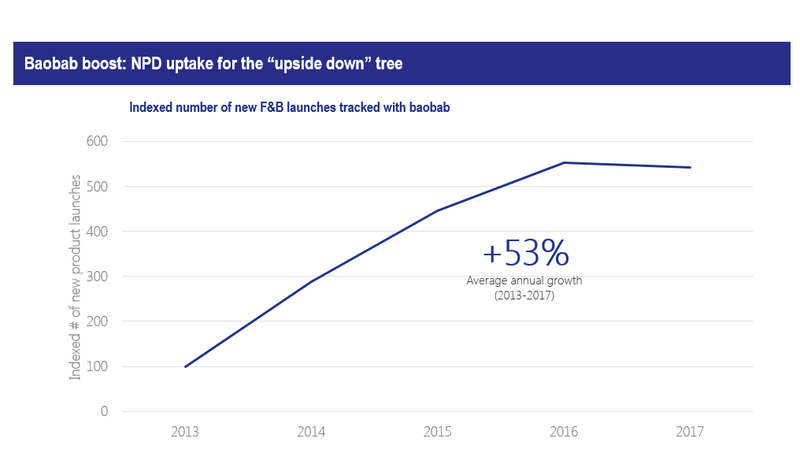 Johnson asserts that the baobab is now experiencing a market resurgence, igniting the thought that things are beginning to look up for the famous “upside-down” tree. The baobab tree is an icon of the African savannah. Innova Market Insights data shows that Europe accounts for over half (52 percent) of all launches tracked with baobab within the food and beverage space while North America follows at 35 percent. Globally, the data reflects average annual growth of 53 percent from 2013 to 2017. Furthermore, Reuters recently reported on the baobab boom, with news that exports of the fruit rose from 50 tons in 2013 to 450 tons in 2017, citing data from the industry group The African Baobab Alliance. The Alliance expects to reach 5,000 tons by 2025, making it a US$400 million industry. The baobab tree is almost unique in that its fruit occurs naturally as a dry powder – the fruit pods dehydrating and hardening on the branch throughout the dry season. It is thought that this process of dehydration naturally concentrates the nutrients in the pods; producing a nutrient dense fruit. As a result, baobab fruit powder is taking the superfood world by storm, according to the company, containing high levels of vitamin C, calcium, magnesium, potassium and dietary fiber. “We see the big future opportunities to be in mainstream products which incorporate baobab as an ingredient for its functional benefits and healthy branding. Products such as biscuits and cookies that are currently at risk of losing market share to new types of healthy snacking brands. By simply using baobab to improve their nutritional profiles, manufacturers of mainstream food items just need to pivot slightly as opposed to re-inventing the wheel,” he says. The superfoods family are commonly used in applications such as smoothies, health bars (fruit bars, energy bars, cereal bars), chocolate and ice cream – and baobab is no exception. However, Johnson adds that the company envisions real future growth in the baked goods, such as in a range of low GI bread and muffins, which thoroughly portrays the cross-category range of the superfood. a strong NPD uptake for baobab. Furthermore, Johnson advocates that baobab can also be used in the sports nutrition market and the company is developing a sports beverage for this industry. A second future innovation is baobab as an ingredient for the tea market. Johnson cites an Oxford Brookes University study that highlights the potential of baobab for blood sugar management in people with Type 2 diabetes. The study found that baobab significantly lowered the glycemic response of simple carbohydrates such as white bread. Put simply, when subjects ate just white bread, their blood sugar spiked. However, when subjects ate white bread with baobab (either when baked into the baking mix, or ingested separately as a smoothie), they showed much lower blood sugar spikes. This stabilizing effect could be of much interest for followers of low GI diets. 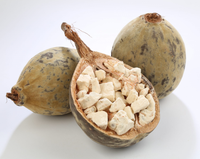 Additionally, baobab has a notably high dietary fiber content (around 55 percent). Roughly half of this fiber content is soluble fibers, and it is this soluble fiber that has been found in studies to have a good prebiotic effect. It has been shown that the growth of intestinal microflora necessary for proper digestion, in particular, lactobacilli and bifidobacteria, and it is stimulated in the presence of the soluble fiber. The insoluble portion of baobab fruit powder is also important, as this provides the roughage necessary for facilitating the movement through our gastrointestinal tracts, the company explains. In terms of sports nutrition, a University of North Carolina study identified the potential of baobab due to its high vitamin C content. The study found that subjects taking doses of vitamin C before exercise and for four days after reported less muscle sourness compared to the control group. Another study by the University of Birmingham found that subjects who took vitamin C exhibited 75 percent more post-exercise recovery than those who consumed vitamin E or a placebo. As the market for gut health expands and the demand for prebiotics grows, a superfood that touts digestive health, as well as low GI and sports nutrition potential, is well positioned as the economic environment strengthens. NutritionInsight has previously reported on the future face of nutrition through a collation of prominent start-ups and in this space, the presence of superfoods is solid from goji berry, maca and ginseng to spirulina, signaling the pervasive popularity of superfoods. May I also remind you to subscribe now to the NutritionInsight newletter service. This will bring timely news, key trends and product developments right into your inbox.